This popular and critically acclaimed text, using movies to help learn about mental illness, has been fully updated with DSM-5 and ICD-10 diagnoses, dozens of evocative and informative frame grabs, a full film index, “Authors’ Picks,” sample syllabus, more international films and shorts….. Films can be a powerful aid to learning about mental illness and psychopathology – for students of psychology, psychiatry, social work, medicine, nursing, counselling, literature or media studies, and for anyone interested in mental health. Movies and Mental Illness, written by experienced clinicians and teachers who are themselves movie aficionados, has established a great reputation as a uniquely enjoyable and highly memorable text for learning about psychopathology. The new edition has been fully updated to include DSM-5 and ICD-10 diagnoses. The core clinical chapters each use a fabricated case history and Mini-Mental State Examination along with synopses and discussions about specific movies to explain, teach, and encourage discussion about all the most important mental health disorders. Each chapter also includes: Critical Thinking Questions; “Authors’ Picks” (Top 10 Films); What To Read if You Only Have Time to Read One Book or Article; and Topics for Group Discussions. • Fascinating appendices, such as “Top 50 Heroes and Villains,” psychotherapists in movies, misconceptions about mental illness in movies, and recommended websites, plus listings of the PRISM Awards for Feature Films and the SAMHSA Voice Awards. Do you want to propose a film for the 5th edition of Movies and Mental Illness? Have a look at the authors' blogspot! They welcome all comments on the films they already plan to discuss, or suggestions for films to include in the new edition! "Movies and Mental Illness, 4th Edition by Danny Wedding and Ryan Niemiec is an extraordinary resource for any educators wishing to illustrate complex mental health issues using the popular medium of film. The writing is clear and enjoyable to read. Although the book is specifically designed for an undergraduate psychology course and even includes a sample syllabus, it can readily be applied to graduate medical education. The book is also a helpful resource for clinicians looking to use film in individual or group patient meetings to encourage discussion and reflection.Movies and Mental Illness, 4th Edition is a welcome addition to any clinician or teacher wanting to use film as an engaging supplement for education." " This book has a large audience - ... ranging from lay persans wishing to gain an insight into mental health in an easily digestible format through to those formally teaching mental health courses. It can easily be used by non-healthcare professionals or those who would like a light introduction to mental health without having to digest numerous textbooks, or like myself prefer a different way of learning." "A winning text for students with pedagogical tips for teachers … Movies and Mental Illness allows educators to weave psychological concepts and issues into a format that naturally engages students and facilitates classroom participation. [It] presents a cornucopia of ideas on how to integrate film as a best practice in the education of students, patients, and the public about mental illness. Finding the right film is a daunting and delicate task for teachers. 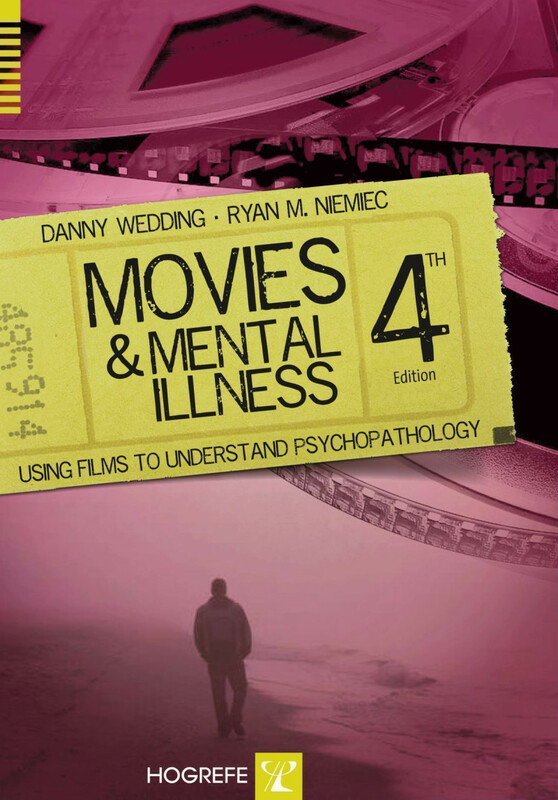 Wedding and Niemiec’s text enables every abnormal or psychopathology instructor to ensure the selected films have been vetted to have maximum positive benefits. Best used as an assigned text in Abnormal Psychology or Psychopathology courses, but also very valuable as a reference book for instructors, since it provides sample syllabi and instructions on how to integrate the use of films within the standard college semester course. Movies and Mental Illness will help educators create the ideal learning experience where students gain an eduction relevant to their lived experience and clinicians facilitate a client breaking through resistances and reaching their goal." "This is an educational and enjoyable read. It can be used in many ways with students, clients, and patients [and] educate people about mental illness in almost any setting. The book does a very good job of providing numerous selections that deal with each mental illness and raise critical questions about their portrayal. I would highly recommend this book to anyone with an interest in how mental illness is depicted in movies." "I have been a fan of Movies and Mental Illness from the first edition. Steven Pritzker, PhD, psychology professor (Saybrook University) and former Hollywood script writer (Room 222, The Mary Tyler Moore Show). "This book provides plenty of thought-provoking material both for teachers and for students. It is highly recommended and extremely helpful in developing and delivering curricula using films toteach about specific psychiatric conditions [and] to teach psychopathology to medical students, psychiatry trainees and other mental health professionals." "To the best of this reviewer’s knowledge ‘Movies and Mental Illness’ is the only book of its kind [...] learning psychopathologies through viewing their portrayal as a moving image [...] the full spectrum of psychopathology is covered via the citations of over 1000 films. [...] In short Movies and Mental Illness is definitely worth a place on the bookshelf of the clinician with any interest at all in this area – which is probably most of us." "A comprehensive teaching tool to engage students in discussion on a wide range of psychopathology. The authors [...] guide us through an extensive list of movies relevant to mental illness. They also provide useful material for class discussion in a user-friendly structure." "This book is a great reference point with excellent teaching material ... and an excellent adjunct teaching tool for people studying psychology." "The authors [...] provided a tremendous resource and well-indexed list of appropriate and timely films for classroom use. Considering how difficult and time-consuming it is to find the right movie clips or films for class, this book is priceless. [...] The book can be a standalone text for a course or used as a supplement to a psychopathology or a psychotherapy course. [It] is masterfully laid out with all of the major disorders covered chapter-by-chapter with an appropriate selection of movie clips. [...] [It] is an essential resource for everyone who teaches psychopathology. This book needs to be on the shelf and in the hands of all psychology instructors. Strongly recommended!" "Practitioners and trainees in mental health and related services can also benefit from films. Guiding the use of theatrical films for training is the aim of [...] Movies and Mental Illness, 3rd Edition (MaMI-3), written by three mental health educators. [...] I applaud the authors [...] As an educator and critic of mental healthrelated films, I have valued MaMI-2 [the previous edition], which sits among my small collection of most-used reference volumes. I consider MaMI-3 [the new edition] to be much better for teachers." "Movies and Mental Illness is a handbook for anyone who wishes to use film to understand and teach psychopathology. It offers a comprehensive account of the depiction of mental illness in non-documentary cinema. This book's enthusiastically delivered central message that film can be used in the teaching of psychopathology is persuasive and it equips its readers well." "One of the most significant challenges to teaching [abnormal psychology] this subject matter is facilitating students' understanding of what the experience of mental illness is like. […] In the third edition of Movies and Mental Illness: Using Films to Understand Psychopathology, [the authors] use films as an instrument for increasing students' understanding of how individuals with diagnosable psychological disorders might experience their lives. […] One of the strengths of this book is that it is written such that nonstudents will find the information contained within easily comprehendible. […] Another notable strength of Movies and Mental Illness has to be its inclusion of sample client evaluations presented at the beginning of each chapter […] [which] offer the reader a glimpse into the psyche of the person of interest and provide a level of understanding of psychopathology that core texts of abnormal psychology do not always make available. […] Another strength of Movies and Mental Illness is the authors' willingness to address not only the disorders but also related issues (e.g., stigma). […] a significant contribution of Movies and Mental Illness is its inclusion of appendices that include (in addition to a sample syllabus) an extensive (over 1,000 entries) list of movies that […] illustrate the manifestation of a psychological disorder." I recommend this volume not just to teachers of psychiatry and psychology, but also to lay people who might be concerned and interested in the issues involved."